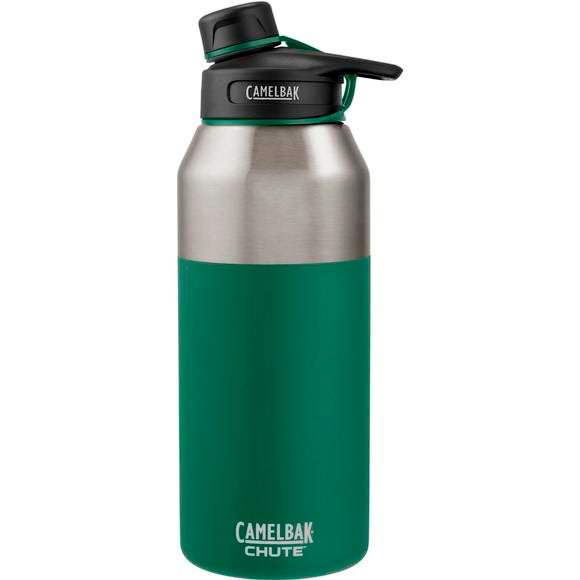 With the Camelbak Chute™ Vacuum Insulated 40oz Stainless Water Bottle, you can get a cold drink and a smooth pour, even in the backcountry. This vacuum-insulated bottle keeps liquids cold for 48 hours (even longer if you add ice), and hot for six. Plus, the cap snaps into the handle, so you can keep it out of the way as you pour. With the Camelbak Chute™ Vacuum Insulated 40oz Stainless Water Bottle, you can get a cold drink and a smooth pour, even in the backcountry. This vacuum-insulated bottle keeps liquids cold for 48 hours (even longer if you add ice), and hot for six. Plus, the cap snaps into the handle, so you can keep it out of the way as you pour. The sturdy, double-walled steel design keeps condensation from collecting on the sides of the bottle, and the powder-coat paint job adds some extra color. The narrow-mouthed opening also makes it easy to drink and pour without spilling, so you won&apos;t waste a single drop. After all, nobody wants to end a long, hard day with a lukewarm drink.